Turn your organic food waste into rich compost for your garden. 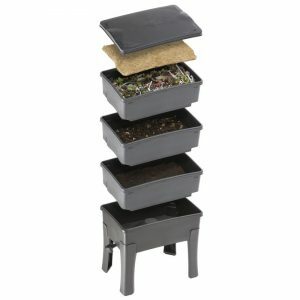 The Worm Cafe is a 3 tray stackable worm bin with a robust design that does not age. It is suitable for both outdoor or indoor use. In our Worm Cafe review, we describe why this worm farm is an excellent choice. The Worm Cafe is a stackable worm bin, made from recycled plastic. There are 3 large trays. It is well-built and stable. The legs include caps to prevent ants from climbing up. Note that in older designs of the Worm Cafe, the legs would buckle under weight. It has a similar design to the Can-O-Worms worm farm except that it is rectangular in shape. So it fits well in corners, taking up much less room than the Can O Worms. Worm castings produced by a Worm Cafe. The proof is in the pudding in our Worm Cafe review. This Worm Cafe review needs to highlight the removable hinged lid feature. Simply lift the lid to one side, peel back the worm blanket and add your kitchen scraps. I also quite like the “How To Take Care of Your Worm Farm” instructions engraved under the lid. Check out our guide on how to maintain a worm farm. The Worm Cafe worm bin comes in colour black and has a sleek appearance. It really looks great. Here’s a view of the Worm Cafe with 2 working trays, a feeder tray on top and a liquid collection tray. 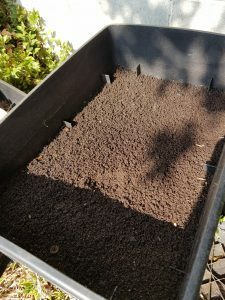 The top feeder tray also has a worm blanket to keep the bedding moist and dark. 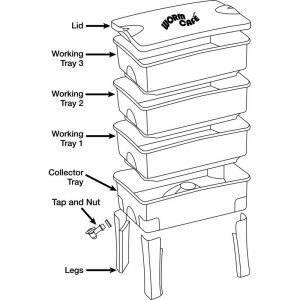 The Worn Cafe worm farm contains 3 trays and a liquid collection tray. The assembly of the Worm Cafe worm farm should only take a couple of minutes. It is super easy to setup. All you need to do is attach the legs, screw the tap on and then sit the trays on top of each other. No tools required! Air ventilation holes are present on the sides of each tray. This means the contents inside the bin will not get soaked when it rains. The liquid collection tray comes with a tap. The bottom tray sits high enough off the ground to be able to place a bucket underneath the tap. I always leave the tap permanently open. The liquid collection tray is slightly angled so that liquid drains towards the spigot. With older designs you may need to elevate or lift the rear on the worm bin for drainage. A Worm Cafe worm bin positioned in the shade. A sleek design which sits nicely in any garden. The multi-tiered design provides a decent amount of capacity and space. 3 trays is more than enough. Otherwise the worm bin might start to look like the Leaning Tower of Pisa. You start out with one tray. When the first tray gets full then that’s your queue to add another tray on top. And when the second tray gets full, the third tray goes on top. When all trays are completely full, take the bottom tray out, empty it for your garden and the cycle begins again. It would not be a complete Worm Cafe review without mentioning the price! And the great news is that this worm bin is not too expensive. It sits in the middle range in terms of price compared to other worm bins. The Worm Cafe is a great choice for intermediate worm composters. It has a sturdy design and a sleek appearance. It has a lasting look and feel that does not seem to age. A great addition to your composting artillery. I have the worm cafe and was wondering if there’s any advice on how to keep the lower levels cool? We have had 40+ temps.. I have my established worm farm in an open shed, under shady trees and i have the lid elevated with timber to allow heat to escape. I have lost all worms in trays 2 & 3 as they went down due to the heat and drowned. This is the second time i have had a mass loss. Is there any instructions or tips (short of bringing them inside) for heat prevention? Keeping your worms cool is a challenge a lot of people face in warmer climates. I live in Melbourne Australia where temperatures can exceed 40°C or 104°F over Summer. 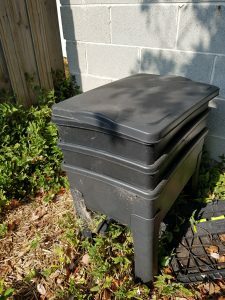 I move my worm bin inside over Summer. Aside from moving your worm bin inside, you can bury a frozen bottle of water wrapped in newspaper in your worm bin to create a cool zone. But this is too easy to forget so moving your worm bin inside is the best thing you can do. Check out this blog post which lists some tips on how you can keep your worm bin cool on hot Summer days.